Allentown Diocese Protection of Youth Requirements Diocesan Safe Environment Coordinator Sister Meg Cole, S.S. J., MS, LFMT 610-332-0442 x 19 Diocesan Victim Assistance Coordinator Ms. Wendy Krisak, MA, NCC, LPC Direct telephone 800-791-9209 The Diocese of Allentown provides assistance to anyone who, as a minor, was sexually abused by a priest, deacon, or employee/volunteer of the Diocese/Parish. Parents, guardians, children, and survivors of sexual abuse are invited and encouraged to contact the Diocese of Allentown for more information about this program. The fullness of compassion should be extended to these victims by the Church. 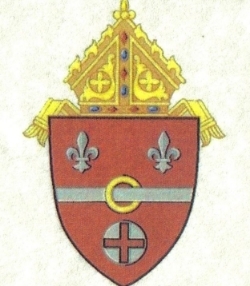 To learn more about the Diocese of Allentown's Youth Protection Programs, Sexual Abuse Policy, and Code of Conduct, please visit www.allentowndiocese.org and click on "Youth Protection" in the upper righthand corner of the page. What does the Church teach? www.allentowndiocese.org/endoflife. For questions, call 610-289-8900 ext. 228. "Interested in what happens at a Catholic seminary? Then check out the new official blog of St. Charles Borromeo Seminary entitled Seminarian Casual, at www.semcasual.org. Worldwide Marriage Encounter - June brings weddings! Remember how you felt about each other on your wedding day? A Worldwide Marriage Encounter weekend can help re-kindle those romantic feelings. For more information or to register: visit www.aweekendforyourmarriage.org or call 609-581-7399.